Hannah Steenbock is a German writer of Speculative Fiction. She uses both her native German and English as languages for her tales, as she loves English and tends to think in that language when plotting Fantasy. After finishing university with a degree in English and Spanish, she lives and works in Kiel, the northernmost state capital of Germany. Her other pastimes include working as a therapist, riding horses, strolling along beaches, talking with trees, and devouring as many stories as time allows. Her book "Sequoia" won two awards in the Turning the Pages Book of the Year Awards, for Best Short Story Book of the Year 2013 and Best Folklore Book of the Year 2013. 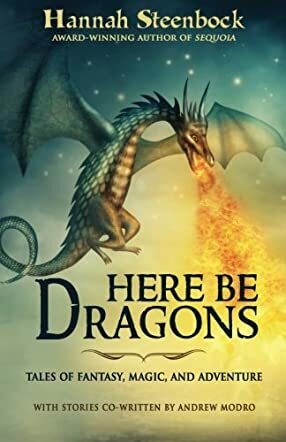 Here Be Dragons by Hannah Steenbock is a collection of eight short stories about magic, mythical creatures and sorcery. From a traveling wizard that fixes toys, to a wizard who loses and searches for his magic deck of cards. From a young girl that tries to defend her village from murderous slavers, to a dialog about a collector of injured winged creatures. From an aging centaur that just happens to be a talented Bard, who is about to give the performance of his life, to a fireworks loving dwarf that lands in the middle of a conspiracy against his old friend, at his highness’s royal wedding. The last tale begins with a group of magic schools holding a masquerade ball. The prize student of one school is beside herself while trying to find out how a blue eyed wizard from another school was able to cast a charm over her. As she tries desperately to remove the spell, nothing seems to work, so she sets out to find her captivating nemesis. Ms. Steenbock does an awesome job of putting together this group of short stories that, each in turn, will take the reader to a wondrous place. All of her characters are as unique as their stories. Hannah’s introduction to each story entices the reader to discover what is on the next page. Each story leaves you either hungry for more, or lost in its thought provoking tale. Here Be Dragons is filled with perfect bedtime stories that will fill your children’s dreams with wonder. Hannah's books takes you on many fantasy trips....none of which will leave you wanting. She writes from the heart and is always inspiring. I have read every book she has written, in fact she is my favorite author, as she takes me away from the misery that surrounds ones real life, into a wondrous fantasy of happiness, heroes, heroines, dragons, and every manner of magical beast and being and never leaves you feeling sad or lost or upset at the ending. Instead she gives hope, light, love...and inspiration.